"Winter Sunset at Valley View in Yosemite National Park" I captured this image in February a few years ago in similar conditions as the weather is there currently in Yosemite - rain and clouds down in the valley with snow at the higher elevations. This day we headed out thinking that it was raining and no chance of a sunset. As we headed out the clouds started to clear with the sun poking through. Each minute just started to get better and better! 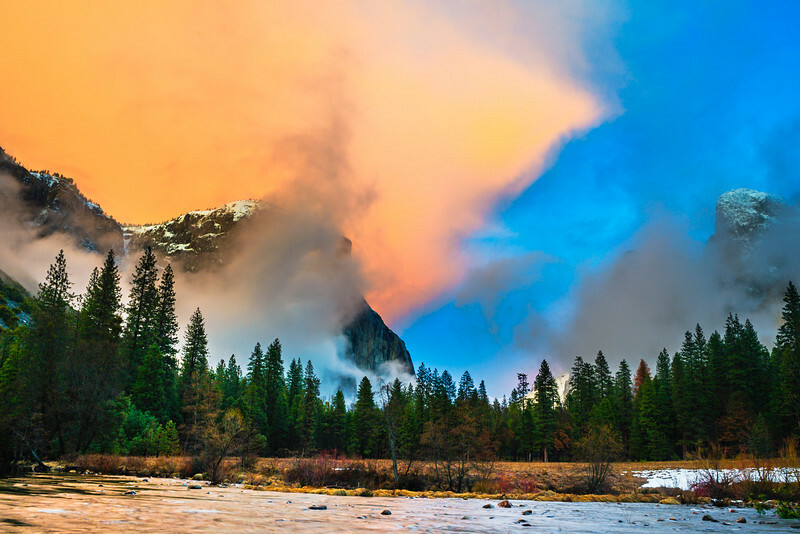 Like a symphony unfolding in mother nature's concert hall - the drama and excitement changing each minute in Yosemite. El Capitan﻿ totally covered in clouds one minute, wide open the next. No sun one minute, orange, pink and blue the next! What an amazing time. Hoping to head up to Yosemite and catch another clearing storm! The great thing about taking photographs in Yosemite is the weather, clouds and lighting creates totally conditions so that image you capture won't look like anyone else! Go to Yosemite and take lots of pictures!